Palolem Beach is one of the most Ideal beaches in the western state of Goa and every year it attracts tourists from all over the world. 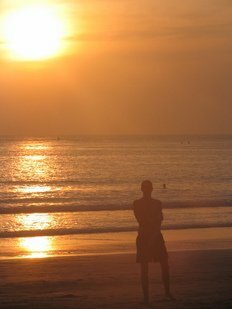 On my original trip to India I stayed at Palolem for about two weeks and loved every minute of it. I really thought I had found a little bit of paradise. Since my original visit to the beach, I have been eager to share my experiences and encourage people to visit this truly amazing place. Unlike the northern beaches of Goa, such as Calangute and Baga which are to overcrowded and touristy, Palolem offers the perfect balance of serenity, privacy and nightlife. Palolem is a little slice of heaven and I do not know a single soul who could avoid falling in love with it. The white sandy beach gently curves round to form a crescent shape while the warm blue waves of the Indian ocean roll in from the open sea. The village which despite the large influx of tourists every year has managed to remain a local and traditional village just with a few added souvenir stalls. Dotted along the beach are the cafes, bars and restaurants some of which offer cheap accommodation out the back in the form of a small village of raised wodden chalets. The chilled out vibe of the beach and the people makes for partying in Palolem truly awesome. Every night you can find live music, be it Reggae, Dance music, Rock, or a bit of classical Indian, Palolem has it all. One of my favourite nights is the Silent noise party which offers the unique experience of dancing to great music while listening to headphones. It sounds a bit strange I know but DO NOT knock it until you have tried it, it makes such a great night! There are a couple of venues that offer different parties so keep yourself updated and in the loop by talking to people and looking out for ads etc. Some bars such as the Cafe Del Mar is open 24 hours and is a great place to meet other drunken tourists who really should be in bed! Butterfly beach which is to the South of Palolem often has great parties aswell but if you have had enough of partying you can always stroll the beach and find a camp fire or two. 1. Watch dolphins while eating breakfast? If you are lucky you can watch them from the beach but if not take a trip on a fishing boat, not expensive. 2. Go exploring.At the far north of the beach is a small island that looks like a set from Jurassic park and is well worth exploring. It is possible to walk at low tide but it is not a long swim. 3. Help the fishermen..pull in the fishing nets and haul the boats on to the beach. When the locals are bringing in their catch, they're always grateful for a helping hand. 4. Go for a shave. Indian barbers are highly skilled with a sharp knife and do a fantastic head massage too. Well worth it. 5. Take a yoga lesson, begin Tai Chi, Chi Qong, Meditation or even Bollywood Dancing. Also comes highly recommended are the Ayvedic massages. 6. Dance to silent music? Yes, the silent raves take place at various locations throughout the week and are well worth a visit. 7. Shopping.There are lots of souvenir shops selling some pretty all sorts of things, most notably some pretty cool t-shirts. 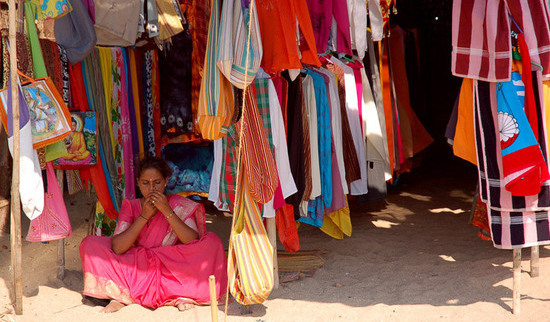 Of course you can find all the traditional handicrafts from all over India as well. 8. Go out fishing.Catch a fish and take it to a restaurant for it to be cooked for you, can anything be more satisfying?! 10. Charter a boat You can charter a traditional fishing boat an sail up the spectacular coastline. Go fishing, drink beer and visit deserted beaches. Palolem beach is incredibly easy to reach as it sits about 3 kilometres from the closest train station, Canacona Rail Junction. The station is well connected to the rest of Goa and you can get trains to Panaji (the capital of Goa), from the rest of India. It costs about 40 Rupees from the station to the beach by Rickshaw. Most people fly to Mumbai and then fly again down to Panaji which takes about an hour (14 hours by Bus)! It is possible to get a taxi from Panaji to Palolem but it is nearly 70 km away and is expensive so the best bet is the train. If it's not available you can take the bus from Panaji to Margo (40 kms away)and then onwards to Canacona. A rickshaw from Canacoa to Palolem costs about 30 rupees maximum. 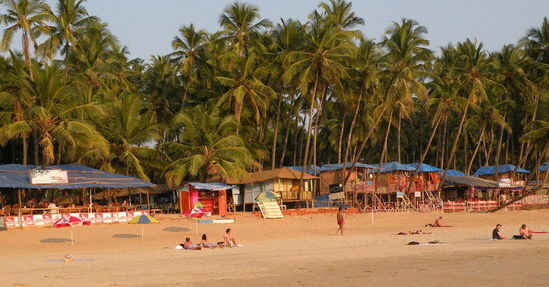 Palolem has a huge selection of accommodation to choose from. There is the 5 star Intercontinental hotel just up the road with its own private beach but personally I would choose somewhere a little closer to the beach. All along the beach are bars and restaurants that have a selection of beach huts ranging in quality and price. You can get a basic small beach hut with an outside, communal shower and toilet for as little as 100 rupees a night, or for something more lavish, anything up to 2000. The best way to find what you want is to simply go for a walk and have a look. Find out prices and make up your own mind. There are a few resorts that are close to the beach but you will miss out on all the beach has to offer. The night-life, activities and the general vibe that keeps people going back year after year. Here are a couple of personal recommendations for places to stay, close to the beach. La Ben Resort is just 120 Yards from the beach offering high standard of accommodation with ceiling fans, private balconies overlooking an inviting splendid greenery at all season with a charming view of the sun filled lawn and garden below. All the rooms have private bathrooms with western style toilets. This was one of my favourite places in India and although I was not actually staying there, I spent the majority of my time time there. Positioned at the far south of the beach, the Cozy Nook is exactly what it says. With a great value restaurant and chilled out ambience it is my top recommendation as a place to stay and/or just hang out. Depending on when you go rooms cost about 500 to 2000 and are all well equipped with electric and great views. They don't do on-line bookings but just turn up and if there is no room, simply stay somewhere else until there is. On the north side of beach is the Alessandra Resort which was built around five years ago by two Israeli guys. There are 11 bamboo huts, most are en-suite and have amazing bathrooms with real hot water! They are all beautifully decorated and furnished and some have there own balconies with sea views. There is also a great restaurant, friendly staff and service. Rooms cost between 2000 and 500 depending on when you go. The best time to visit Palolem Beach is between the months of October and April when it's lovely and sunny pretty much all of the time except for the occasional, short lived electric storm which only adds to the excitement of being in this magical place! Between the months of December and February it can get a bit chilly at night so take an extra jumper. I remember on one sunny day, while relaxing with a beer, a huge bolt of lightening slammed into the sea about 20 meters from where I was sat. The noise was terrifying but the general fear and excitement led to a truly electric atmosphere.... shortly later the sun came out again! 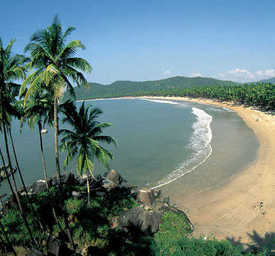 I hope you enjoyed this page about Palolem beach, one of the best beaches in Goa and in India. Please feel free to contribute to this page by contacting me directly or leaving a comment below.